The Unitech MS140 family of bar code slot readers is a flexible, cost effective solution when you demand a reliable and rugged slot reader. With a resolution of up to 6 mils (0.15 mm), the MS140 is capable of reading any bar coded identification badge. Its sealed optical system is available in both visible light or infrared. The infrared units ensure accurate reading of either visible and laminated badges. Its water resistant base and rugged housing make the Unitech MS140 a popular choice in any environment. An optional mounting bracket is available to safely secure the unit in any direction. 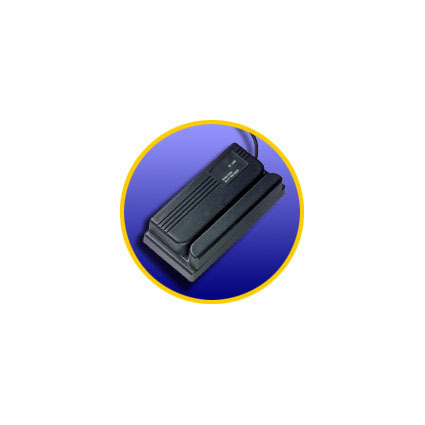 Like most of our products, the Unitech MS140 is available with a variety of interfaces, including undecoded (TTL), keyboard wedge (XT/AT, PS/2 and Macintosh), and RS232. All Unitech undecoded products have pen output and can be connected to any of the our wedge line or to any external device that accepts pen input. Decoded versions are easy to use and configure. Both the keyboard wedge and RS232 can be configured on-screen by selecting the desired options from a menu. And the configuration can be reproduced in other units by generating custom setup labels.